Fantastic Four Rise of the Silver Surfer sees one of the worlds most famous and best loved comic book series return in this fantastic sequel. The game provides players with one of the best story lines I have ever seen and it is completely captivating from start to finish. The game also has some of the best graphics I have seen and is easily playable but be warned you will not be able to leave it alone once you start. 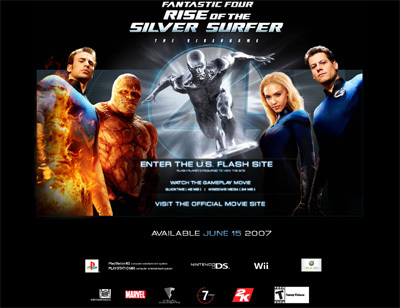 We have also compiled a Review System for this, of which Fantastic Four Rise of the Silver Surfer is Rated as Five Stars, the highest possible score available from the Game Review Team.